Ask anyone when the first spy cameras appeared on the market and they might hazard a guess at the 1940s or 50s. In fact, this camera cunningly hidden in a pocket watch dates all the way back to 1886! Auctioned off at Bonham’s a few years ago, the tiny ‘nickel plated, engine turned, hunter type pocket watch case’ conceals six section telescopic lens tubes with internal meniscus lens and a front-mounted rotary shutter. Bonham’s reportedly sold it for a cool £18,000. 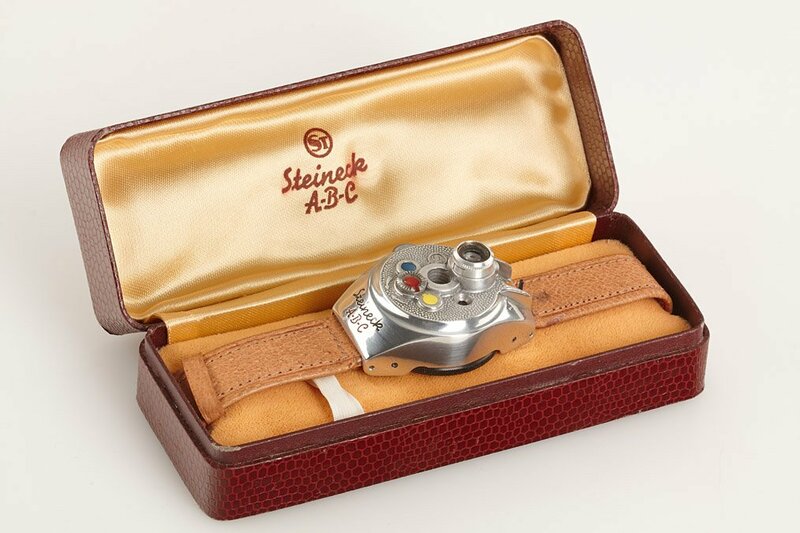 This camera-in-a-watch from Steineck was reportedly a big seller in the 40s and 50s, impressive when you consider that it didn’t work as a watch and the camera wasn’t exactly well hidden. An agent would apparently carefully aim the camera while pretending to check the time. How they didn‘t end up with hundreds of shots of their own face is a secret best left with the espionage community. A gadget in true James Bond style, the Suzuki Echo 8 is a camera contained in a fully functioning cigarette lighter. 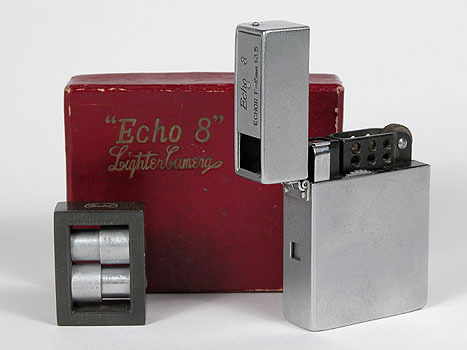 It’s perfectly possible to fill the Echo 8 with lighter fluid and spark up with it. However, it should be said that wise heads don’t exactly recommend it due to the tendency of the lighter fluid to seep into the camera and cause the metal body to decompose. Still, you can still pick one up on eBay if you have $1100 going spare. 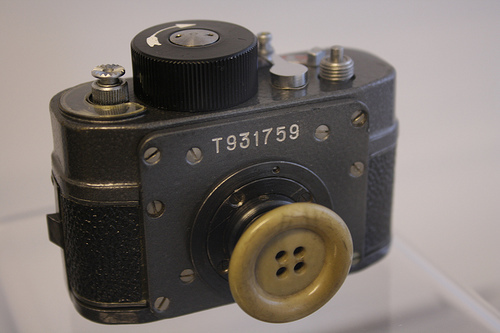 Sadly not as clandestine as it sounds, effective operation of this button camera required the user to be wearing a very bulky coat, which probably wouldn’t look suspicious at all. Once the camera was in place, you’d operate it via a primitive cable release in the pocket. At the time this would have run your average CIA/KGB agent the equivalent of about four months’ pay presumably not factoring in the additional cost of an enormous jacket. While this is reportedly a fairly old idea, it recently got a fresh update from Fred Flare in the form of the Secret Book Camera. 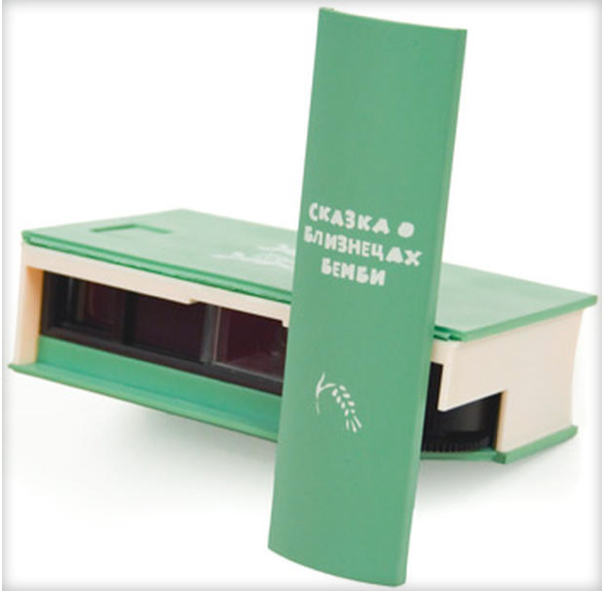 A 110 film-using camera cunningly concealed inside a plastic Russian novel, the Secret Book Camera is probably one of the most awkward things to admit that you own in polite company. Fred Flare are no longer in business for some reason. Yep, it’s what it looks like. Someone disguised a camera as a pack of cigarettes. It’s quite clever really. The long extended ‘cigarette’ works as a wind handle and there’s a hidden button shutter release on top. 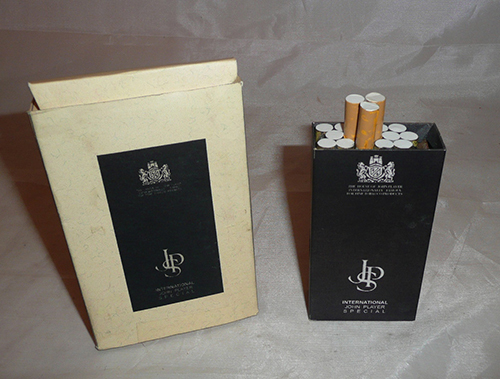 There’s even space for a couple of real cigarettes, in case you need to keep up the charade for an extended period of time.